Completely new 1859 tree, all wood construction (no plastic or foam used here). Steel stirrup hangers, correct steel rings and staples, covered with new rawhide. Our stirrups are bent by hand and correctly shaped. The center spreader is held in place by two rivets, as were the originals. New brass plates, Civil War type shield and correct iron Civil War hardware used throughout. Only the best harness leather is used. Comes complete with coat straps and English indigo blue wool girth; ready to go. This saddle will fit a modern day horse and is machine sewn. Specify stirrup size: 3" or 4 1/2" CSA shield and clipped corner slot plates are available for the '59. Please check the current catalog for saddle prices, and the 1859 McClellan Equipment we have to offer. My good friend Doug Locke, D.V.M., loaned me General John Wilson Sprague's saddle from his personal collection to use as a guide to reproduce the Civil War Officer�s McClellan saddle. I am excited to be able to offer a reproduction of this historic, battle-ridden civil war saddle. Also, I can make a replica of the officer grade headstall, breast strap, and leather valise included with General Sprague�s saddle collection. This saddle is covered in black "fair" leather, has brass moldings over pommel and cantle, and a padded seat. Pigskin is used on the seat and is fancy stitched, same as the original. It is a replica of those used by many generals during the Civil War and after. Hair padding under the leather seat, English or 1859 girth rigging, coat straps, iron hardware, covered stirrups, skirts, fenders and girth. Wooden saddle tree covered in rawhide. This WW1 saddle replica follows the original specifications, original tree used, or a new wide 1904 style. New russet leather cover, correct side skirts, wool covered underbars on tree, cavalry model US covered stirrups, brass hardware, six coat straps. English style rigging. No original girth available at this time. Please check the current catalog for saddle prices, and the 1904 Saddle Parts and Equipment we have to offer. You will be completely satisfied with this WWI McClellan saddle. This 1928 WW2 McClellan saddle follows the original specifications, original tree used, or a new wide 1904 style. New russet leather cover, correct side skirts, wool covered underbars on tree, cavalry model US covered stirrups,brass hardware, six coat straps. English style rigging. No original girth available at this time . Please check the current catalog for saddle prices, and the Saddle Gear we have to offer. You will be completely satisfied with this WWII saddle. 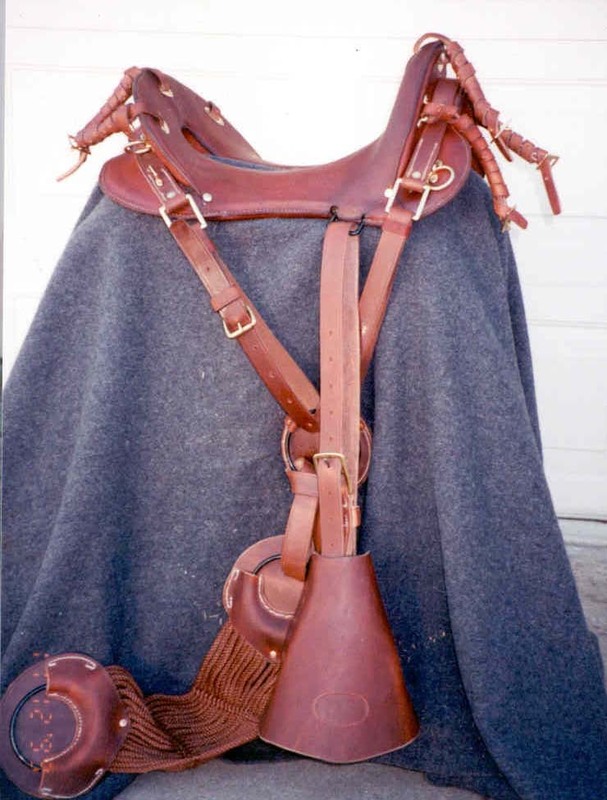 This is the 1874 McClellan saddle with saddle bags. Special orders #85, dated April 10, 1872: The 1859 McClellans were to be covered with black collar leather and the skirts to be removed. There were to be leather safes, 4 1/2 by 4 3/4 inches added under the girth strap "D" rings. Our saddle comes with a newly made 1859 tree, new leather covering, all iron hardware, six coatstraps, 1872 model wool girth, 4 1/2 inch covered embossed stirrups. Comes in tree lengths of 11, 11 1/2, and 12 inches. Please check the current catalog for saddle prices, and the Indian War Saddle Parts and Equipment we have to offer.